After traveling the world with his now wife, Kim, and eating fresh, local food at many restaurants and hotels, Levi Lawrence (BBA, 2011) returned to Fredericton knowing he wanted to find a way to provide New Brunswickers with easier access to local food. It wasn't until he jumped on the opportunity to build a business plan and pitch his idea to local, successful entrepreneurs through UNB's International Business and Entrepreneurship Centre's annual Business Plan Competition that he saw his vision became a reality. 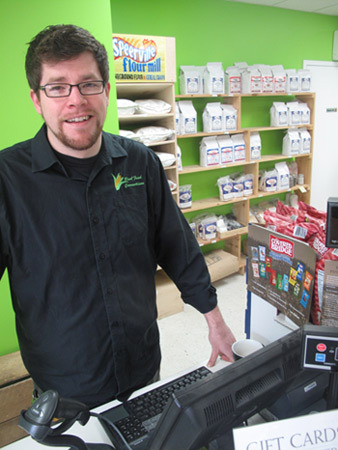 Real Food Connections, a company that provides fresh, local and many organic foods to your door, has been in business for three years and continues to grow in popularity. Last year, they grew their business by opening a store and are expanding their delivery service to Saint John and Moncton. The success RFC has seen over the past few years proves that Lawrence was not alone in his desire to have access to fresh, local food. "We are very lucky to live in New Brunswick," said Lawrence. "We have a fantastic variety of real food being grown or produced here. Local food is a viable and often healthier option that I'm proud to see people embrace." Although he's made a name for himself and RFC is a success, Lawrence says he knows he can still turn to his former professors and advisors at UNB. "My time at UNB gave me the time and support needed to develop the skills, contacts and most importantly the self-confidence to create my own business," said Lawrence. "I still have many advisors, peers and professors that I keep in contact with and I know that although I am finished my studies at UNB I can always go back for help."